Just reported by Ynet (in Hebrew), Hirbet Midras, the site of the Byzantine church in the Ella Valley with the incredible mosaic floors, uncovered just two months ago and visited by tens of thousands of people was deliberately and brutally vandalized Wednesday night. The Antiquities Authority had made considerable effort to prepare the site and had decided to leave the mosaics uncovered so that people could visit and see them. The supervisor and archaeologist in charge, Alon Klein of the Israel Antiquities Authority’s Crime Prevention unit was shocked to find the destruction this morning when he arrived at the site. 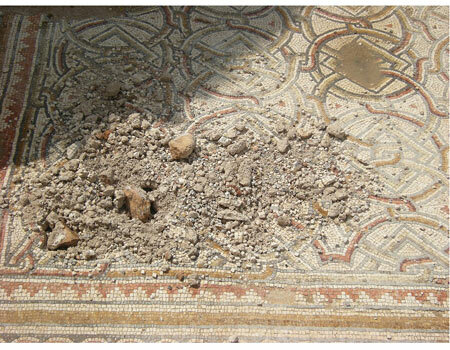 “Someone took a hammer and attacked the mosaic, digging them up in a large number of spots. A person hiking in the park had reported the damage. The mosaic looks like it has been hit by mortar shelling. It’s a sad sight, heart breaking. The mosaics suffered serious damage as a result of brutal vandalism. ” said Klein. The Antiquities Authority has filed a criminal complaint with the police who are investigating. The mosaics will now be covered to protect them. When asked about whether the damage could be repaired the response was that it would be time-consuming and require a significant outlay of money but hopefully it could be done (at least to a certain degree). This on the heels of the explosion yesterday near the entrance to Jerusalem and the escalation of rockets and mortar being fired on Beersheva and the coastal cities of Israel from Gaza. Sigh. 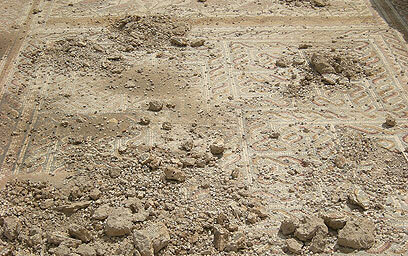 This entry was posted in Archaeology, Art and tagged Byzantine, church, Khirbet Midras, mosaic, mosaic floor, postaweek2011 on March 24, 2011 by Shmuel Browns. One of the excavation supervisors of the site is also the chief of the preventing antiquities robbery unit of the Israel Antiquities Authority. I will not be surprised to learn that the damage to the mosaic was purposely made by one of his many enemies. Such a shame, to see all that unnecessary damage done to an historical site. It was either a mentally sick or just plain evil person, or someone of another religion who hates Christians and Christianity. We all need to respect one another regardless of whether we believe in another’s faith. Things like this should never happen anywhere. There are actually people (a certain group of people) who have for centuries carried out the destruction — erasing — of Christian history at every turn; (i.e. In Iran, Iraq, Pakistan, India, Afghanistan, Kuwait, Syria, Egypt, Tunisia, Libya, Constantinople, Turkey, Lebanon, etc.) Is anyone surprised that this latest attempt at erasure is just more evidence of the plight of Christian culture, and Christians themselves?